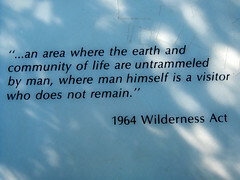 On April 17, 2012, the U.S. House of Representatives passed HR 4089, the Sportsmen’s Heritage Act, supposedly “to protect and enhance opportunities for recreational hunting, fishing, and shooting.” The bill is a thinly disguised measure to gut the 1964 Wilderness Act and protections for every unit of the National Wilderness Preservation System. Specifically, section 104(e)(1) strips away the Wilderness Act’s prohibitions on the use of motorized and mechanized vehicles, motorboats and aircraft, other motorized equipment, and structures and installations for any activity related to hunting, angling, recreational shooting, or wildlife conservation. For example, this would allow for any hunter, angler, or recreational shooter to drive their ATV in Wilderness as long as they were engaged in one of these activities. While the sponsors of the bill have stated this isn’t the law’s intent, an amendment to the bill to make certain this wasn’t the result was opposed by the bill’s supporters and defeated in a House vote. Section 104(e)(2) would waive “any requirements imposed by the Wilderness Act” for federal public land managers or state wildlife managers for any activity undertaken in the guise of wildlife management. In addition to allowing the construction of roads and unlimited use of motor vehicles and aircraft, this provision would allow any sort of wildlife habitat manipulation that managers desire to do. Logging would be allowed, for example, to create more forage for deer or elk. Reservoirs and watering holes could be bulldozed for bighorn sheep. Lakes and streams could be poisoned, and exotic fishes could be planted to provide more angling opportunities. Predator control, including aerial gunning, trapping, and poisoning would be allowed. There is literally no limit to what managers could do in Wilderness in the name of wildlife management. And if all this isn’t enough, the non-partisan Congressional Research Service points out that because Section 104(c) of the bill bars application of the National Environmental Policy Act (NEPA), none of these activities will need to undergo any environmental review for their impacts on wilderness values, wildlife, or threatened and endangered species. The bill is backed by the Congressional Sportsmen’s Caucus, Safari Club International, and a coalition of hunting and gun-rights organizations, including the National Rifle Association. These groups are trying to rush this bill to the Senate floor for a vote. It is imperative that you contact your senator now and urge them to oppose HR 4089! HR 4089 must be blocked in the U.S. Senate! 1. OPPOSE HR 4089. It guts the Wilderness Act and strips protection from every single unit of the National Wilderness Preservation System across the country. 2. Massive human manipulations of fish, wildlife, and habitat like those allowed by HR 4089 should not be allowed in our precious Wildernesses or they will cease to be Wildernesses. 3. HR 4089 would allow roads and motor vehicles in Wilderness, and the construction of dams, buildings, and other structures with any connection to fish and wildlife. 4. Environmental review under NEPA must not be waived by HR 4089. In 2014, will we celebrate or will we mourn the 50th Anniversary of the Wilderness Act? Please Act Today!